This stunning coral island located 100 metres off the north east coast of Zanzibar offers a unique secret escape for adults only. Pongwe Lodge offers guests an unforgettable life experience. This is the ultimate romantic escape for couples, experienced travellers, nature lovers or food lovers. The Island welcomes whoever is willing to try an unconventional detox journey. Savour the contrasting colours of nature from the green of lush flora to the turquoise blue of the Indian Ocean. Be inspired by the sophisticated gourmet selection and the attentive and personalised service in the most exclusive location in Zanzibar. Located on the north east coast of Zanzibar, just 34 km from Stone Town, The Island is built on a natural coral rock in the quiet Pongwe Bay. Just 100 meters away from the coastline, it offers unforgettable sunset and sunrise views. The landscape changes with the influences of the tide, giving the place a unique characteristic and an appreciation of nature at its best. The Island is the perfect end to a Safari, complementing the same connection with nature as in the Savanna. A stay at Pongwe Lodge can equally be an incredible start to an unforgettable holiday. The cycle of high and low tide creates a magical atmosphere. Depending on tide levels, you may need a canoe to reach the coast while at low tide it is possible to walk to the beach opposite the Island. This is a kind of throwback to ancient and primitive lifestyle which regenerates appreciation of nature in those who come to experience our secret hideaway. The Island has only 6 beautiful villas, ensuring peace and privacy. There are 5 Standard Villas (35 sqm) and 1 Luxury Sultan Villa (70 sqm), all facing the ocean. 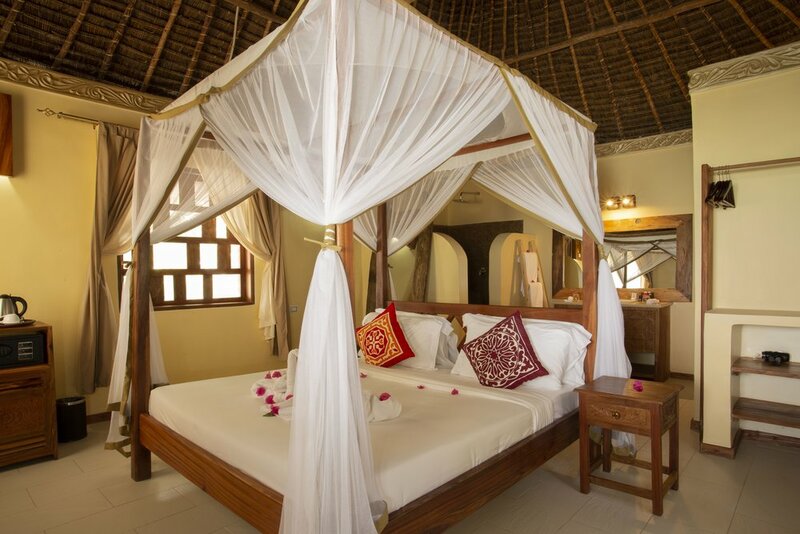 Each room is cooled under the shade of surrounding trees and has its own veranda with comfortable seating outside to enjoy a romantic sunset, sunrise or the incredible star constellations of Zanzibar. Privacy is an important feature of The Island, but its real distinction is attention to detail and guest satisfaction. All rooms are eco-friendly with fans and there is no air conditioning in the rooms as it is not necessary. Although Wi-fi is available only in common areas, TV and music are not allowed. Every detail is designed to allow guests to relax in the beautiful nature of their surroundings and to protect their privacy and the harmony of the Island. The 5 Standard Villas (35 sqm) have ceiling fan, safe box, mini bar, tea and coffee making facilities, shower and toilet with separate bidet, bottled water and hairdryer. The Luxury Sultan Villa (70 sqm) faces the ocean. 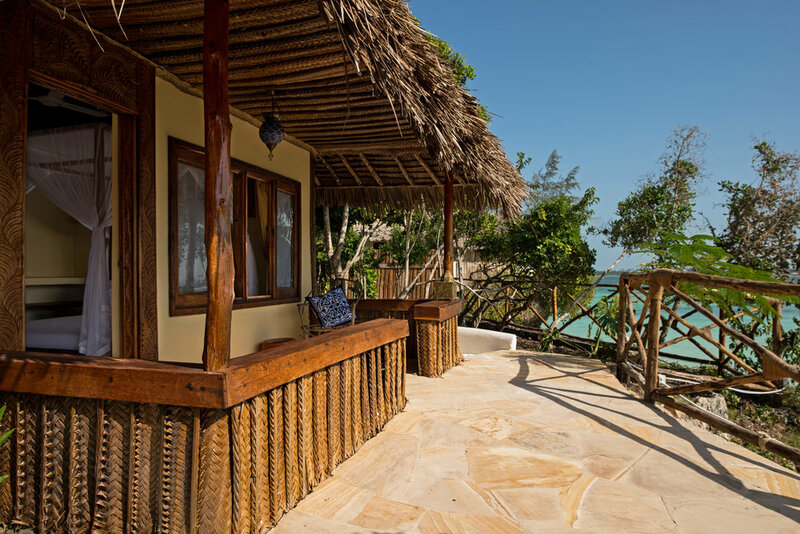 The villa is hidden in the shadow of the trees and has its own veranda with romantic seating outside to enjoy the sunset, the sunrise and the starry sky of Zanzibar. The villa has ceiling fan, safe box, mini bar, tea and coffee making facilities, shower and toilet with separate bidet, bottled water and hairdryer. The gourmet restaurant offers gourmet dining prepared with a sophisticated and artistic touch, ensuring a blissful experience that will satisfy even the most demanding culinary expectations. All meals are freshly prepared blending local flavours with the rigours of gourmet cuisine. Being surrounded by nature and the crystal-clear ocean ensures a perfect and relaxing experience. 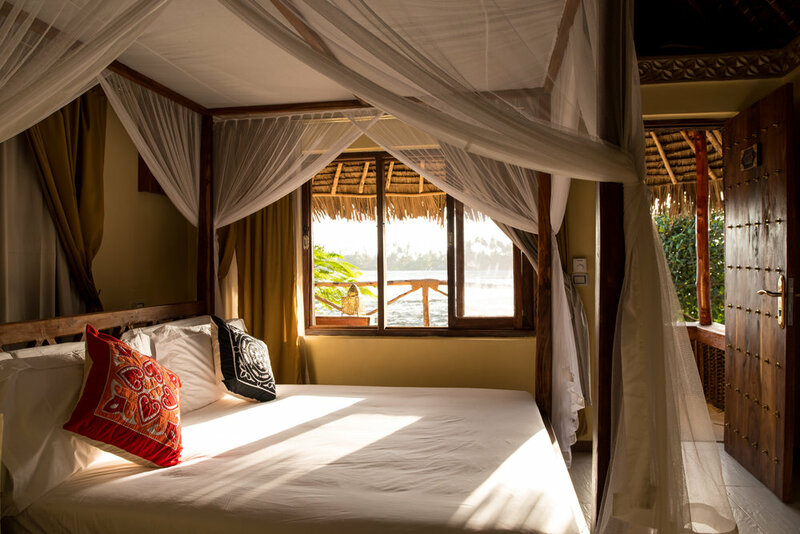 The Island Pongwe Lodge is ideal for a total escape vacation featuring the best culinary experiences. which includes breakfast and a choice of either lunch or dinner is available with a supplement. Drinks are not included. For those seeking total privacy and really do want their own island, choose The Island to experience an exceptional holiday. Thanks to its limited space, The island is the perfect choice for small groups of friends that want to throw an exclusive party or couples who want to have a magical wedding in an exclusive location. It is possible to book the entire island with the assurance that nobody else will be allowed to access the facilities, so that couples or small groups can benefit from the luxury services exclusively and enjoy their stay in total relaxation.